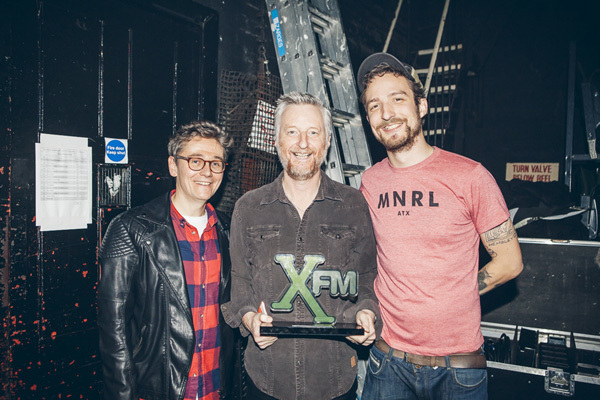 At the recent XFM Winter Wonderland, we got the opportunity to head back stage and interview some of the artists on the bill. 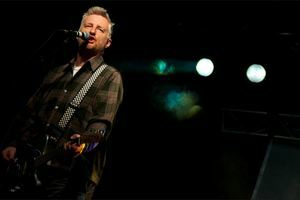 First, we spoke to singer, songwriter, activist and east Londoner, Billy Bragg, who has been rumoured to be putting his name in the hat for the Mayoralty. We asked him about his political ambitions, his music and his favourite place in the capital. You’ve just picked up the XFM Inspiration award. What inspiration do you think people get when they see and hear Billy Bragg? "I’m really pleased for that recognition. I’d like them to take away that it’s possible to do things on your own terms and still make a living. I’m never going to sell-out Brixton Academy, but I’m making a living. I’m doing it by being a bit of a troublemaker, a bit argumentative – standing up for what I think is right." "Playing live is how I’ve earned a living and next year’s going to be the same. The last couple of years I’ve been touring with a band which has been really great and I’ve enjoyed it a lot, but now I’m getting back to doing what I do solo as you’ve seen tonight. I relish that as well, being out there playing a completely different sound, being able to talk without wondering about the band and what they’re doing and fitting all the songs in." You recently said that politics was too important to be left to the politicians. Are you tempted to get in to politics? "I’m happy to do what I do. If I was in the Labour Party now and was an MP, I’d have real trouble with the party line; I’m not that sort of person. I think that the contribution you can make as someone who is using their platform to offer a different perspective — I’ve probably got more licence to do that to pick and choose and talk about the things that I believe in without having to worry about where the party’s going." Are you the last of the protest singers? "You’ve got to accept that music no longer has a vanguard role as a social medium. When I was 19 years old, if I wanted my voice to be heard, the only way I was going to be able to do that was to play guitar, write songs and do gigs. Now, if you’re 19 years old and you’re angry and you want your voice to be heard, you’ve got Twitter, Facebook, write a blog, make a film. None of these things were possible when I was 19. "If you want to know what your generation is saying, you’re more likely to look at social media than you are to music and as a result of that, music has lost its anger." "I really like the British Library, there’s some amazing stuff. I’ve been in there a couple of times recently doing research around the pre-history of British rock — and they have a really good café in there. "In the reading rooms I get books from the 1950s, old copies of Melody Maker and NME , go back through all that kind of stuff and make notes — I really like that sort of stuff. Karl Marx wrote Das Kapital in the reading rooms of the British Library so we’re in good company there." We also nipped in to The Horrors’ dressing room, who had quite an impressive rider! We spoke to to Rhys Webb and Josh Hayward of the Southend-on-Sea five piece. Luminous was a self-produced album, how did that affect the creative process? RW: “The last two albums were self-produced. We’ve worked on the last three records with Craig Silvey who’s a good friend of ours who mixes the records, but strangely enough it’s been very much the same process. We worked with Geoff Barrow from Portishead and Craig co-produced our second record, Primary Colours, but they wanted us to do our own thing and to make the most of our tracks as we had them and the sounds that we’d created. And what can fans expect from the new record? 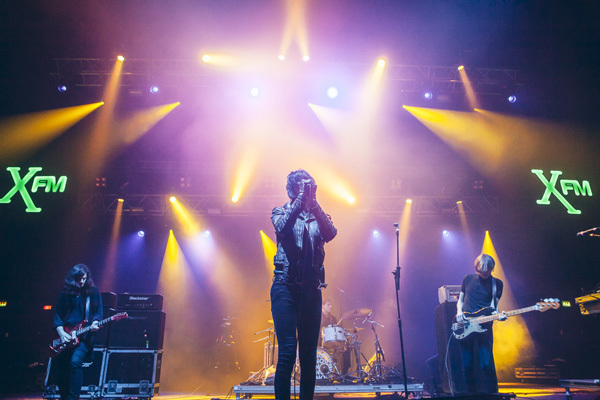 Just how special is a place like Brixton Academy to play? RW: “Considering we’re talking about how many venues we’re losing on a weekly basis, it makes you realise how special it is when you get back here and hopefully it’s safe in its foundations and won’t be going anywhere any time soon. With venues closing down has London’s music scene changed as a result? RW: “The problem is no. London always has a healthy, exciting music scene with new bands — they’re just forced out of some of these crucial venues. You need venues with smaller capacities to play because how are they ever going to get to get the band rolling and get things happening if they don’t have those opportunities?